Women of the ELCA has compiled a list of Tools for Leaders. Our constitutions describe how Women of the ELCA operates as an organization. The constitutions are living documents that explain how we will live our lives together as a community of women created in the image of God. From time to time additions and deletions are made to the constitutions (through the process for change that is laid out in the constitutions themselves), as our circumstances change. Download the latest versions of the constitutions that reflect changes voted on at the Tenth Triennial Convention (2017). Below you can find logo information, “A Place for You” PowerPoints in Spanish and English, congregational unit update information, synodical web page links and leaders report forms, treasurer information, synodical leader’s guide, convention dates, offering information, and a “how to write resolutions” document. The Tenth Triennial Convention of Women of the ELCA was held July 11-13, 2017, in Minneapolis, Minn. The triennial convention is the highest legislative authority within the organization. Read and study the actions taken at the Tenth Triennial Convention in 2017. Read and study the actions taken at the Ninth Triennial Convention in 2014. Our logo—with the cross, water and a white lily—identifies women of the Evangelical Lutheran Church in America as children of God; baptized, forgiven, adopted into God’s family, full of grace and hope in eternal life. It is a reminder of the growth, beauty, and vitality that rises out of that life-giving baptismal water. It is also a reminder of the mission of the church to “Go, therefore, make disciples of all nations; baptize them in the name of the Father and of the Son and of the Holy Spirit” (Matthew 28:19). If you are attending or planning your synodical women’s convention, a synod assembly, or a special event, why not order some Women of the ELCA identity boxes to take along? Choose between two boxes: $100 (worth $233) or $250 (worth $543). Best of all, shipping is free! Feel free to order one of each. Download the order form and mail it in with your check. For additional items not on the order form, visit our online store. Download this welcome flyer and print as many copies as you need to introduce future participants to Women of the ELCA. Use it as a quick guide to find our web address and contact information. Descargue este folleto de bienvenida e imprima tantas copias como necesite para dar a conocer nuestra organización a futuras participantes de mujeres de la ELCA. Utilícelo como una guía breve para contactarnos. 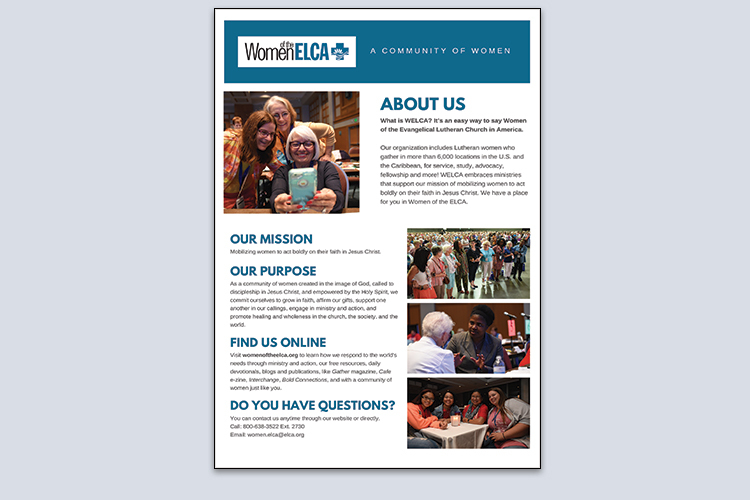 Perfect for new members and outreach efforts; get to know the mission and ministries of Women of the ELCA with this booklet. Also available as a PowerPoint in English and Spanish to share with women in your congregation and beyond. Synodical presidents are responsible for updating primary contact information for congregational units. For information and/or instructions on the process, contact the churchwide offices. Please submit the report within two weeks of your synodical women’s convention. (Please save the form on your desktop before filling it out; otherwise, your work will be lost. Open it with Adobe Acrobat to complete it). The Tenth Triennial Convention and Gathering of Women of the ELCA was held in mid-July in Minneapolis, Minn. View speaker videos here. View photos here.